Cucumber is most commonly used in salads. It cools your stomach and prevents acidity. Putting its nutritional benefits aside, cucumber is used for many other purposes too. 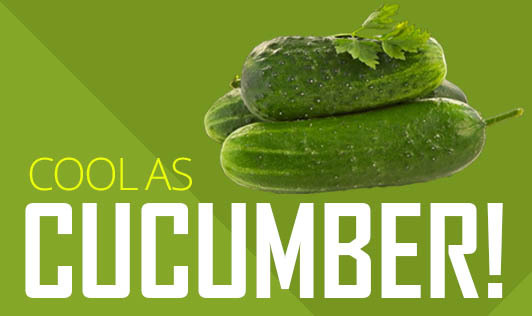 Read more to find out the different uses of cucumber that you might have never imagined! • Place a few slices of cucumber in an aluminum vessel and place it in your garden or pot to get rid of pests. • Is your mirror fogging up? Rub slices of cucumber on the mirror to clear the fog. • Cucumber juice or cucumber slices can be used as a substitute to coffee or tea to boost up your energy. • Can't find your shoe polish? Just rub a slice of cucumber on your shoes to keep it shining! • Put few slices of cucumber in a pot of boiling water and breathe in the steam to reduce stress. • Having bad breath and you don't have any mint? Just place a slice of cucumber on the roof of your tongue and press it for 30 seconds. • Cucumbers make a great cleaning agent! It can be used to clean steel, sinks etc just by rubbing it on the surfaces that needs to be cleaned. • Made a mistake while writing an important document? Just rub cucumber peel on it and it will be gone! This works great on wall writing too! Do you still think cucumber is only a salad vegetable? ?